The ability to deal with psychological stress. In an intercultural context one is confronted with different cultural and interpersonal situations that must be coped with. First of all you have to get acquainted with the concept of emotional stability; what is it and on what is it based. Secondly, you have to be aware about your own feelings, thoughts and behaviour by doing small tests. 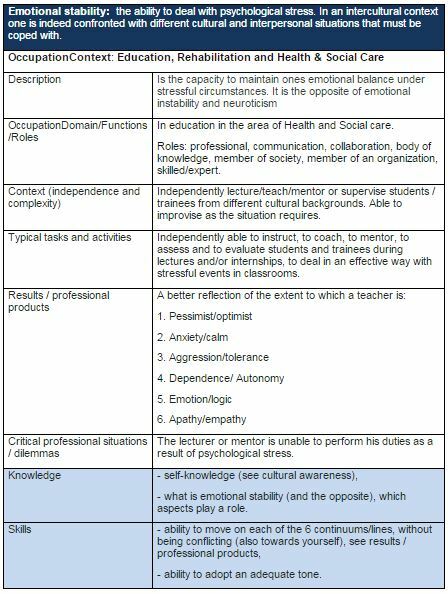 Third, emotional stability has to contribute to your competences in teaching or mentoring students from another country and culture, with other values and norms than you have. How can you ‘understand’ empathy of individuals different than ourselves? To reach these goals, you read theories; view video’s, make assignments for yourself and discuss cases on a forum with your peers. Emotional stability is the capacity to maintain ones emotional balance under stressful circumstances. It is the opposite of emotional instability and neuroticism. Emotionally stable persons tolerate minor stresses and strains of day to day living without becoming emotionally upset, anxious, nervous, tense, or angry. They are able to maintain composure under minor emotional stress. They are fairly constant in their basic mood, and they generally revert quickly to that state following those occasions when they have experienced considerable stress or have been exceptionally provoked. The unstable person, on the other hand, is subject to fairly wide, frequent, and often unpredictable mood shifts that may swing from pole to pole1. Emotional stability enables the person to develop an integrated and balanced way of perceiving the problems of life. This organizational ability and structured perception helps one to develop reality-oriented thinking, judgment and evaluation ability. One develops feelings, perceptions and attitudes that help in understanding the realities of life and conditions and circumstances that create miserable situations in life. Such understanding helps one promote high ego strength2. Emotional stability is an important indicator for multicultural competences. Competent teachers and mentors are expected to teach and supervise students / trainees from different cultural backgrounds and are able to improvise as the situation requires. Especially in international classrooms or groups, with a mix of cultural backgrounds, it can be hard to deal in an effective way with stressful events and situations. Teachers and mentors need the capacity to maintain ones emotional balance under these stressful circumstances and stay far away from emotional instability or neuroticism. This balance is playing a role in several natures and emotions, like pessimism/optimism, anxiety/calmness, aggression/tolerance, dependence/autonomy, emotion/logic, apathy/empathy. The quality of the education and mentoring of foreign students/trainees depends to great extent on the professional competence and emotional stability of teachers/mentors. Emotions like frustration, unhappiness, dissatisfaction, reflect in a negative way on the students and trainees.Therefore it is important to control emotions in a proper way. Emotions tend to direct to short-term decisions, whereas decisions made with our rationality will have longer term values. Emotional intelligence is an important feature to keep good balance between emotions and ratio. Emotional intelligence helps to minimize the negative impact of emotions on failure. This shows the importance of emotional intelligence. In this module Emotional Stability you have 4 assignments. Read in ‘Development of emotional stability scale’3 the ‘introduction’ and ‘materials and methods’, including the questions. Based on the concept of emotional stability, 6 dimensions of emotional stability are defined: pessimism-optimism, anxiety-calmness, aggression-tolerance, dependence-autonomy, emotion-logic and apathy-empathy. Fill in this self test. Do you recognise your self? What are your strengths and weaknesses, or: which points are beneficial when supervising or teaching students and which points have to be improved? Describe briefly. Fill in this emotional stability self test and score your results. What does this self test tell you about your emotional stability? Is the result what you expected and why? Write down. Based on what you have read, give  concrete examples how you could enlarge emotional stability in general. Please use the suggestions, written by Maharana Nisha and Rathod Meena Budhisagar in a study of emotional intelligence of higher secondary school teachers of Madhya Pradesh. Also  describe how you can improve your own emotional stability in your own professional life as a teacher/mentor. How can your work environment support you? Write all answers [1-3] and discuss them.